I thought I would share this interaction I had this week from someone that emailed in. Does it matter that I do not change my oil filter with each oil change? Thanks for the question and yes, it definitely matters. 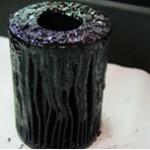 Filtration is one of the most important parts of your oiling system. If your filter is not changed on a regular basis it will build up debris and the filter will become clogged. Once this happens the oil in the system will then just bypass filtration completely and dirty oil will be running through your motor. This will in turn rob your car of power and fuel efficiency not to mention the detrimental effects dirty oil can have on your engine. To get a better idea, take a look at the picture I attached, just imagine oil (clean or dirty) trying to get through that filter after all the sludge has built up on it. Other parts of the engine can end up looking just like this. This build up in the motor can cause hot spots which in turn damage the motor (head gasket, bearings etc). Although, even if this practice was followed for some time with an automobile, things can be cleaned out (this will not fix any damage that was already done, but may prevent more from occurring). Amsoil offers an engine flush product that is added to the old oil before the oil is drained to loosen all debris so they are drained out. Then choose an oil and filter that Amsoil offers that matches what your car requires and with the added detergents that are formulated into the entire line of Amsoil engine oils this will keep your engine clean and operating as best as it can, in turn offering you better mpg’s and more power. Please let me know if I can assist you in any way in getting your car the correct Amsoil oil and filter to help clean up your motor, or if you have more questions please don’t hesitate to ask. Wow that was a much more detail answer then I suspected you would offer. Please send me more information about your engine flush product. Does Amsoil offer a similar product for my transmission? Certainly, the most comprehensive information about our Engine and Transmission Flush product, can be found at this link below. It has detailed information, more photos of transmission components and engine heads before and after cleaning. Hope this helps you, and as always if you have more questions please don’t hesitate to ask.